Crew: Jeep Miller, Ralph, Eric Miller, Dan Goos, Loren Cole. Sponsors & Support: Omaha Media Group, Brumely Supplies, The Finish Line Car Wash, Conductix, The Permanent Solution, Carson Body Shop, Cen Pro Graphics. Special thanks to Gary & Shirley Annan, grandparents Jeep & Ruth and Donna & Loren, and Aunt Kandi. 1997 - 5th place in Junior 1 Points at Bobcat Speedway. 1998 - 4th place in Junior 1 Points at Bobcat Speedway. 1999 - 2nd place in Junior 2 Points at Bobcat Speedway. 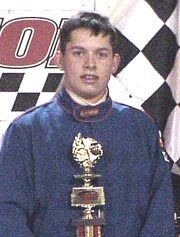 2000 - Bobcat Speedway Junior 2 Championship. 2001 - 4th place in Junior 2 Points in the Southwest Iowa Kart Dirt Series, 3rd place in Junior 2 Points at Botna Valley Speedway. 2002 - 7th place in Pro Am Points, Rookie of the Year Runner-up at Shelby County Speedway. 2003 - 1 Pro Am Feature win, 12th place in Points at Shelby County Speedway. 2004 - Raced only three times, nothing too spectacular. 2005 - 12th place in Stock Car Points at Shelby County Speedway. 4th place in Stock Car Points, 1 Pro Stock Feature win, 5th Place in Pro Stock Points, Best Appearing Car Award and Most Popular Driver Award in the Pro Stock class at I-80 Speedway. 2006 - 14th place in Stock Car Points at Shelby County Speedway. 2007 - 7th place in Pro Stock Points at I-80 Speedway, Most Popular Driver Award in the Pro Stock class at I-80 Speedway. 2008 - 8th place in Stock Car Points at Shelby County Speedway. 2009 - 11th place in Stock Car Points at Shelby County Speedway (only raced half the season). 2010 - 5th place in Stock Car Points at Shelby County Speedway. 2011 - Did not race. 2012 - 12th place in Modified Points at Shelby County Speedway. 2013 - 14th place in Modified Points at Shelby County Speedway, 18th place in Modified Points at I-80 Speedway. 2014 - 7th place in Modified Points at I-80 Speedway, 21st place in Modified Points at Adams County Speedway. I started in Go-Karts while my dad raced a Hobby Stock at Shelby County Speedway. I won my first A Feature in my second year of racing Pro Ams. Built a new car, the "Hot Rod Lincoln", and won another race at I-80 Speedway. Achieved several awards over the years in the Stock Car. Took a year off in 2011, and now switching to Modified for 2012. Top 5 in Points, no DNF's, Feature wins. 90 was my dad's number and I used it when I was racing Go-Kart, Stock Car, and Modified.